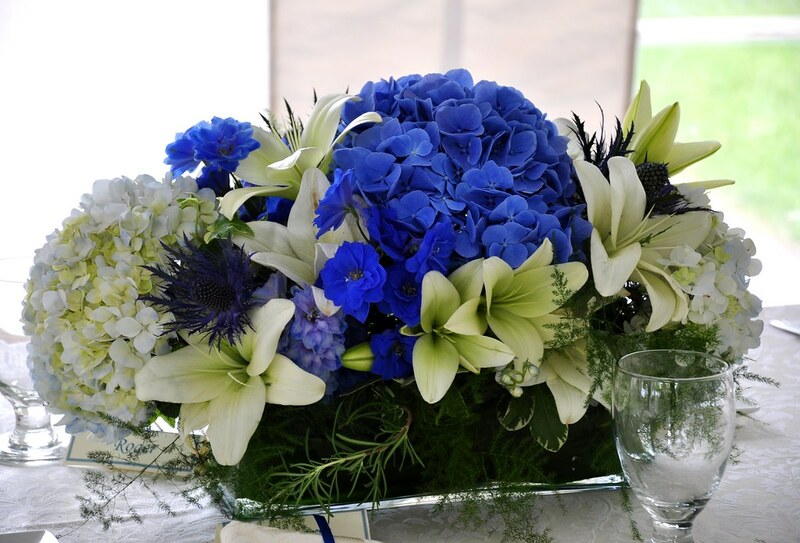 Patty’s favourite colour is blue, and when she asked me to do the wedding florals, I knew I had my work cut out for me to come up with a sophisticated look that was predominantly blue, a colour not easily found in flowers – died mums and spray painted carnations not included. Patty also loves to garden, so it was important to find flowers that looked like they might have been found in her own flower beds. After some careful research I found brilliant blue, plate sized Bodense hydrangea from Holland, locally farmed blue tip hydrangea and huge indigo blue delphiniums. I also chose Aryngium in a dark blue for added depth and texture. Patty’s favourite flowers are freesia and lilies, both of which I chose to do in a creamy white so they would stand out from the blue while at the same time making the blue pop even more. A touch of green with lily grass and ivy complimented the blue and white theme and as a final touch I included sprigs of rosemary and thyme which offered an aromatic element to the arrangements. 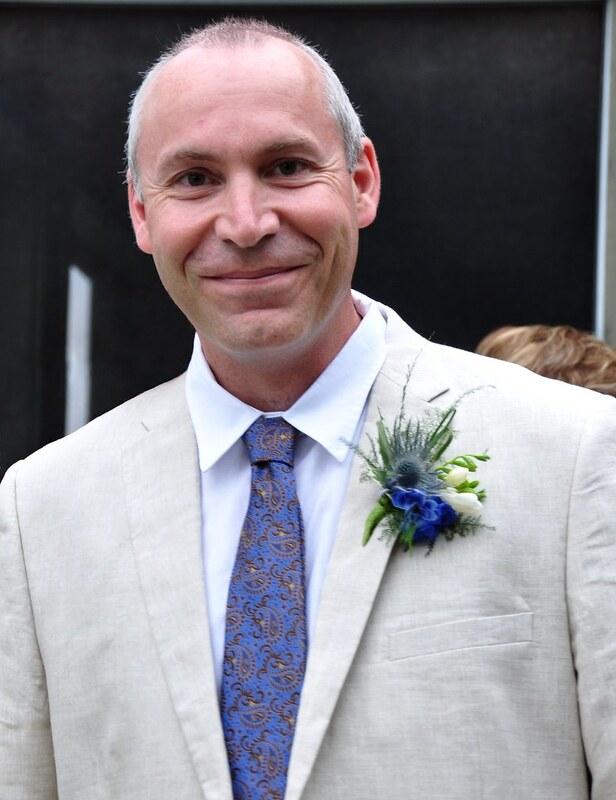 Michael, my husband and resident photographer, took many wonderful photographs of the day’s events. Below are a few shots of the wedding florals. 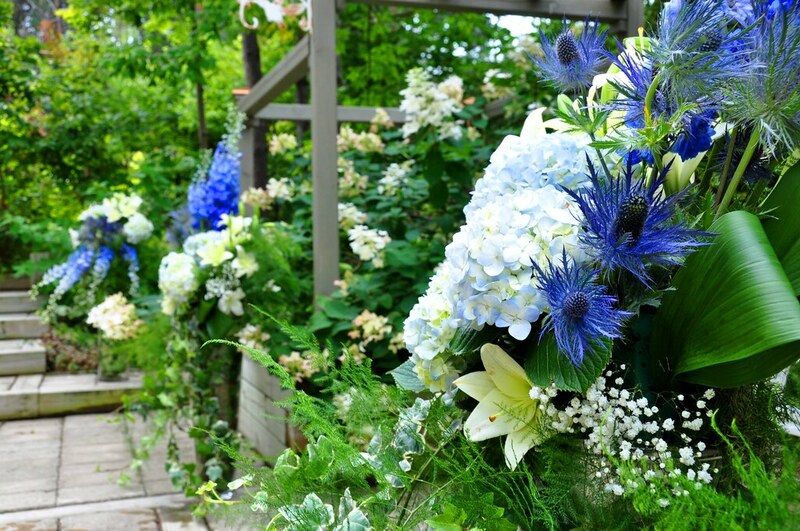 Beautiful blue hydrangea, delphiniums and aryngium combined with creamy white lilies and blue tipped hydrangea, complete with sprigs of rosemary and thyme. Tall, glass cylinders filled with ivy, hydrangea, delphiniums, aryngium, lilies, asparagus fern and gypsophila decorate the ceremony location. Finishing Touches: The brides bouquet is made of 2 dozen beautifully fragrant creamy white freesia, set into a Bodense hydrangea head and detailed with loops of lily grass and oversized ivy leaves. A gorgeous corsage for the mother of the bride made of 6 white freesia, lily grass and gysophylia. 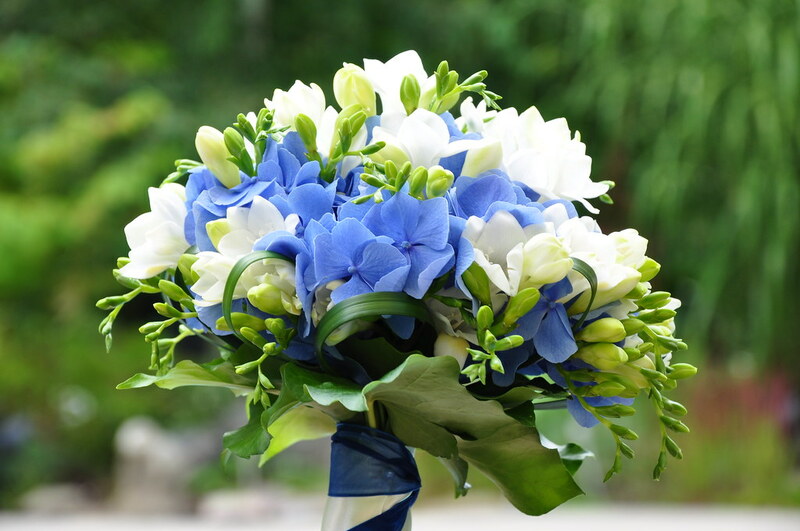 A dashing boutinere composed of aryngium, delphinium blooms and freesia for the groom. Grace Kelly look alike: Patty looks stunning in her cream dress and scarf. 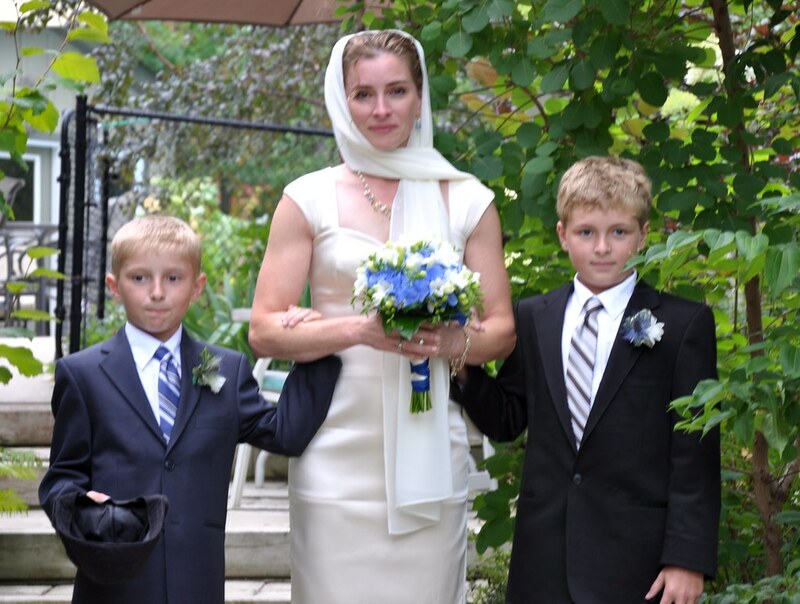 Collin and Evan, her 2 sons, are by her side as she walks down the aisle. 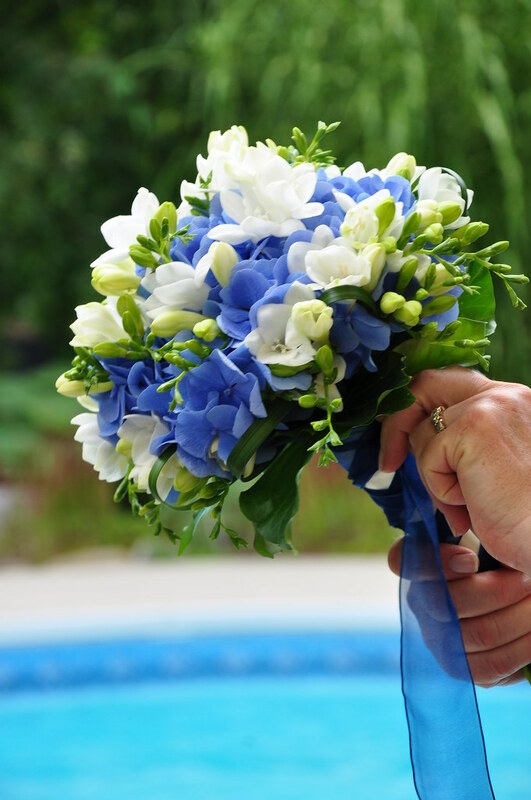 The bouquet is the perfect size and shape, intended simply to accent the beauty of the bride. What a joy it was to be part of Patty and Serge’s very special day. This entry was posted in Floral Arrangement, Uncategorized, Wedding and tagged blooms, delphiniums, Floral Arrangement, freesia, hydrangea, indigo blue, Mums, rosemary and thyme, table arrangements, wedding florals, white lilies. Bookmark the permalink. Both comments and trackbacks are currently closed. Your beautiful arrangements helped to make a special occasion even lovelier. You do such beautiful creative work. 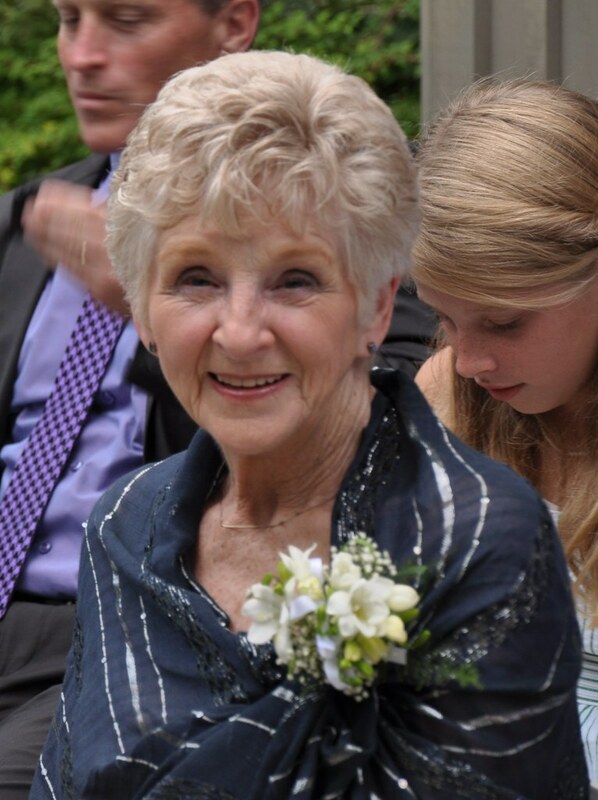 I know that Patty was thrilled with everything that you did–her bouquet especially but, also with the lovely lilies on the wedding cake. Bravo!!! These arrangements are stunning. Absolutely breathtaking. So much so, I might have to plan a second wedding for our 20th anniversary next year. Love that you are inspired by these florals to renew your vows!